Margaret Haydon’s porcelain sculpture is sublime. Rhythmic, layered, and delicate on the surface, each piece evokes strength despite fragility. 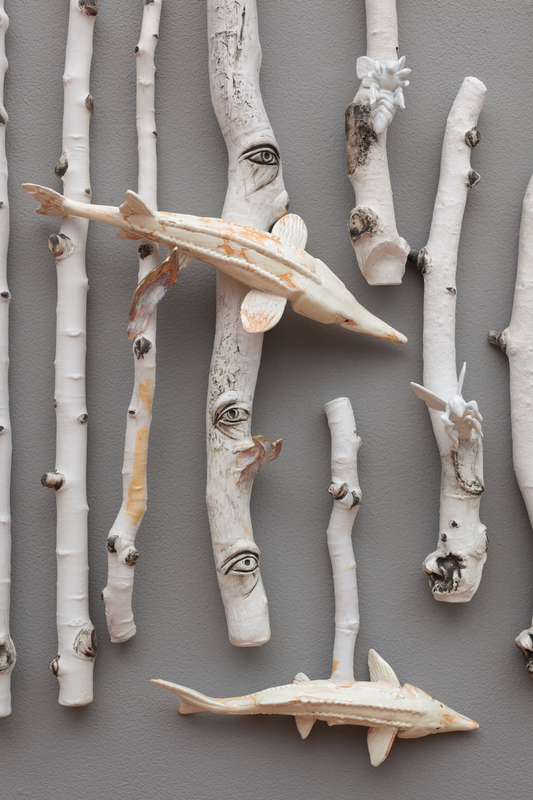 There is the obvious fragility of material as well as fragility of the species represented: bats, bees and sturgeon. Porcelain is a strong material yet the ease with which it can shatter is a poignant metaphor for the relationship humans have with the natural world. Nature is strong, humans are strong — each can easily destroy and be destroyed. Haydon has created a quiet yet active space that invites the viewer to look closer on many levels. Slip cast, wheel thrown, and hand built from porcelain, each piece has then been layered with glaze and oxides. The individual components have been salt fired, a labor-intensive process in which salt is injected into the kiln during the final stages of firing. Salt vaporizes in the flame, flies around in the kiln, and attaches to the ceramic pieces creating the glaze, while also slowly destroying the kiln. 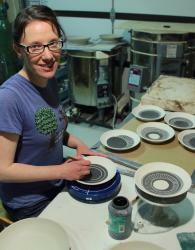 This process leaves surface to chance: kilns are opened to find both happy surprises and disappointments. The beauty of salt firing is in the unknown as well as the juicy, deep surface; sometimes with a light orange peel texture. Glossy, drippy, inviting surfaces can be found next to dry, flaky patches that are just as interesting. This varied surface is an ideal reflection of the animal subject, each imbued with a sacred, quiet strength. The limbic system is the section of brain linked to behavioral and emotional responses, especially survival. Haydon’s exhibit, Limbic Memory, weaves together the mystery of the relationships between these animals and the world around them, where humans see them as creators of delicacies or harbingers of doom. In the case of these animals those lines may be blurred as humans certainly have limbic responses upon confrontation. The narrative of the animal is highlighted through a curiosity of surface. “Blue Offering” and “Offering” initially evoke candy. Their surfaces glisten as though coated in sugar, simultaneously acting as a lure and then repulsing upon the dawn of recognition. Upon entering the gallery, the door is flanked by “Offering” and “Blue Offering.” Diving sturgeon present a visual offering, almost trophy like: a tiny dish of beads representing their prized possession — eggs, our caviar. This visual representation hits home in a way that just seeing sturgeon, or hearing the name would not. It reminded me of the source of caviar in a more visceral way. This sent me tumbling down a tunnel of research into the harvesting of caviar and roe. This living fossil outlived dinosaurs only to be endangered by demand for their precious eggs. Reading about new humane processes to harvest the eggs of the female sturgeon didn’t make me feel much better about their future. The same isn’t true for bats, who have had their share of troubles with humans. While bats have their fans, most of the population is off put by the oddity of flying rodents, their role in horror mythology and the transmission of diseases such as rabies. The fragile yet symbiotic relationship remains: some bats consume tons of insects, some pollinate, and others disperse seeds. Much like the bee and the mysterious blight of CCD, bats are faced with their own challenge in the form of White-nose syndrome. These offerings are not the only pieces that feel almost holy. They ask to be seen closer. 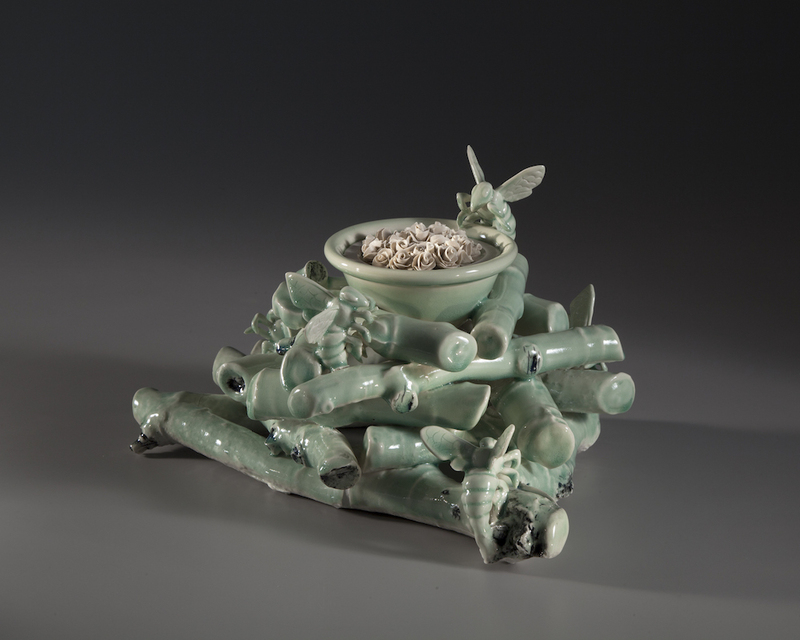 “Small Bees” and “Still life with bees” showcase detailed sculpted bees hovering near or inside bowls with delicate offerings of porcelain flowers. The bees have been frozen in their busy route, a spotlight on their journey of pollination and production. Cupping a tiny bowl in my hands, I can almost feel the vibration of the bee, wings paused, mid-work at a task that seems thankless but would be incredibly, impossibly missed. The crisp fragility of porcelain drives this home. Two “Bat Reliquaries” pause between the bees and the wall of bats. The reliquaries have been highlighted with bats framed on trompe l’oeil branches. Each bat has a niche in its breast that has been lined with gold luster. Hanging inside is the artifact, a tooth — mysterious and beautiful while simultaneously creating curiosity and fear. Looking up, bats hover in formation toward the top of the wall. Paused mid-flight, the forms are identical, yet each speaks individually with different patterns embossed into the wings. 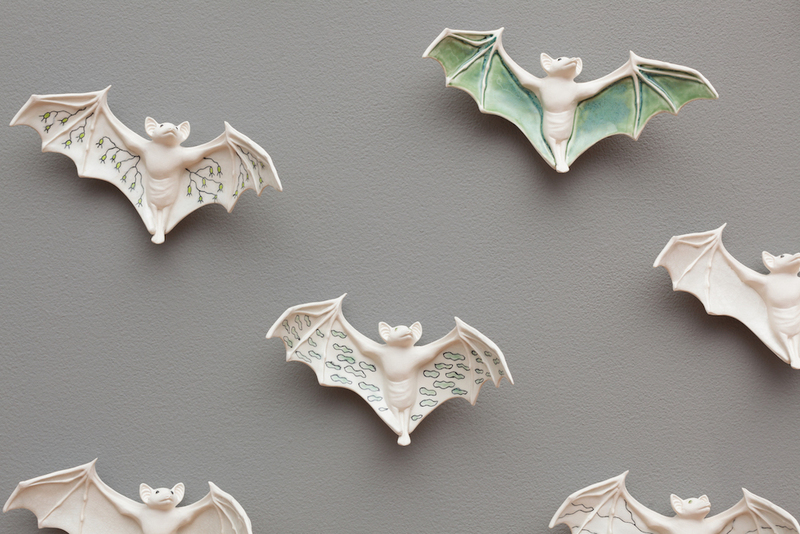 No matter where one goes in the gallery, these bats remain just in the periphery. 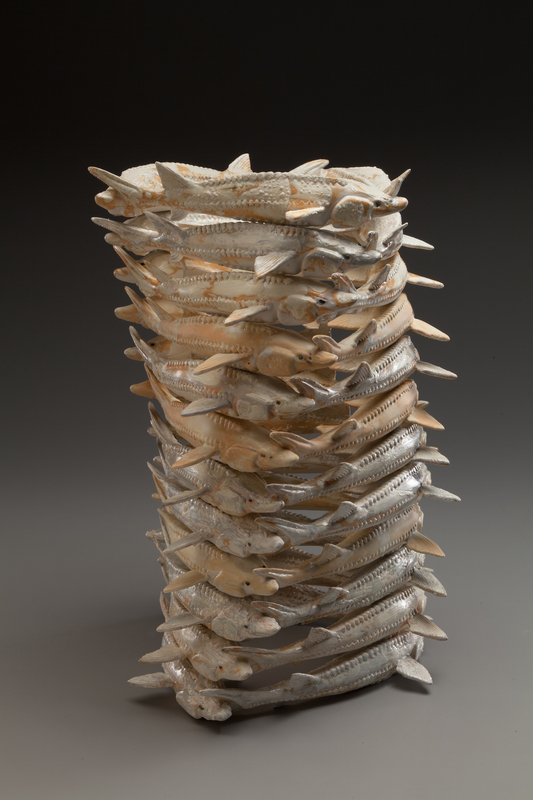 “Circling” is a gravity-defying stacked spiral of sturgeon, the irregular surface a perfect example of the ranges capable of salt-fired porcelain. The fish may be standing still, yet they could just as easily be moving, spiraling through air as if water. 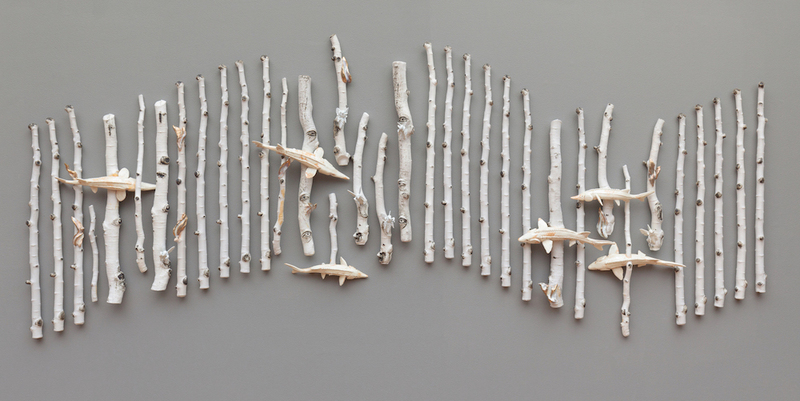 “Sturgeon Song” lines the wall in a rhythmic pattern of porcelain branches. In this large piece, sturgeon, bees, and bats come together for a final song. Closer inspection reveals eyes instead of knots in a few of the branches. We should always look closer. An intricate collection of wall, pedestal, and floor sculpture, Limbic Memory raises questions as well as concerns for our role in the natural landscape. Haydon included a selection of utilitarian pottery, stoneware bowls and platters that illustrate the same thoughtfully layered imagery as her sculpture. I imagine them bringing the conversation full circle to the dining table, often a place of conversation, discovery and debate. 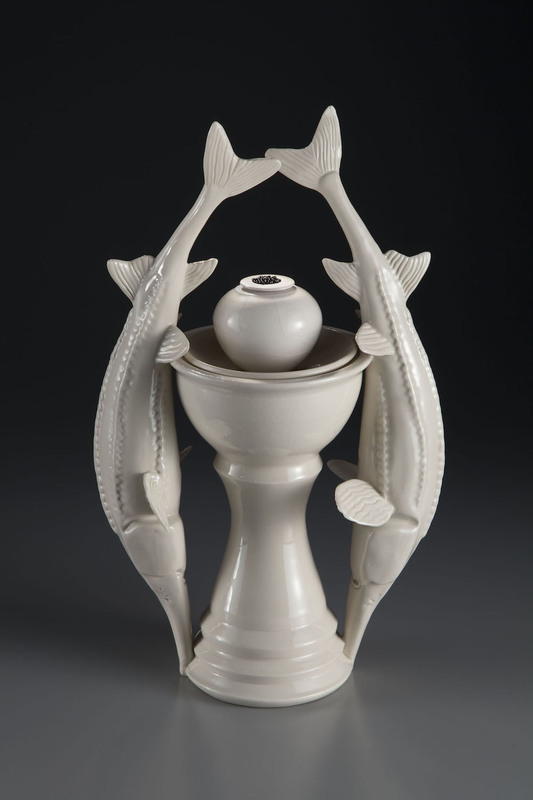 Margaret Haydon is professor of ceramics at the University of Wyoming. Limbic Memory can be seen at Mystery Print Gallery in Pinedale until Oct. 27. Gallery hours are Tuesday – Saturday 12:30 – 6 p.m. and by appointment 307-749-3473.